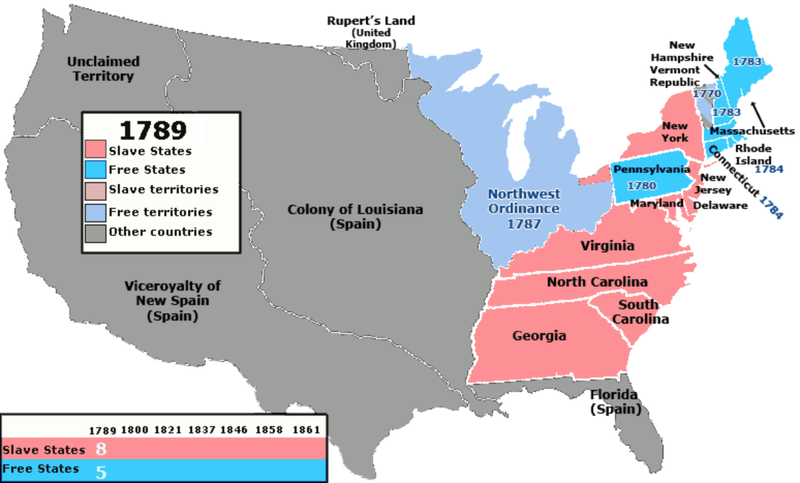 The slave states obtained an inequitable number of representatives in the house through the three-fifths compromise. In the choice of the presidency they perpetuated that same unfairness in the allocation of electors per state. The Constitution set a termination date for the import of enslaved people, but not an end date for slavery itself. The slave power could perpetuate their institution by creating a market — combining supply with distribution — that increased the size and geographic distribution of slaves. The next step was to create new slave states, each with a minimum of three electors regardless of their tiny populations. Gross inequity in proportionality between voters and electors manifested itself in the expansion of slavery to new states over time. For example, the 1840 census reported the population of Massachusetts at 738,000; new state Arkansas, only 98,000. As a result of the Electoral College system, in the 1844 election, Massachusetts citizens got one elector for every 60,000 people, but Arkansas got one for a little more than half that number, 33,000. In the 1852 presidential election, an elector from Massachusetts represented on average 76,000 people. But an elector from the new slave state of Florida represented only 29,000 people. The gross unfairness of representation in the Electoral College gave the country a succession of presidents who were tolerant or even hugely supportive of slavery until 1860. If the national popular vote had been the means for choosing the president, the burgeoning northern population would have produced anti-slavery presidents much earlier than at last occurred with Abraham Lincoln’s election. Instead, thanks in large part to the distortions of the Electoral College, a succession of slavery-supporting presidents failed to resolve the inevitable conflict until the south and north had developed large, robust and very different economic systems. By 1860, fifteen of thirty-four states had adopted the slave system, even though the population of free states was more than twice of the Confederate states. Had the nation been forced to reckon with slavery earlier, the civil war may have been shorter, less bloody, and with fewer long-lasting effects. But without the popular vote, the inevitable conflict was delayed and, as a result, was much worse than it could have been. After the Civil War, the electoral system perpetuated white supremacy in a newly insidious way. In the 1872 election, the enfranchised African Americans helped Grant win most of the states in the Confederacy. But in the 1876 election, white Democrats used violence and terrorism against the African American population to regain political power, and Democrat Tilden defeated Hayes in most of the former slave states. 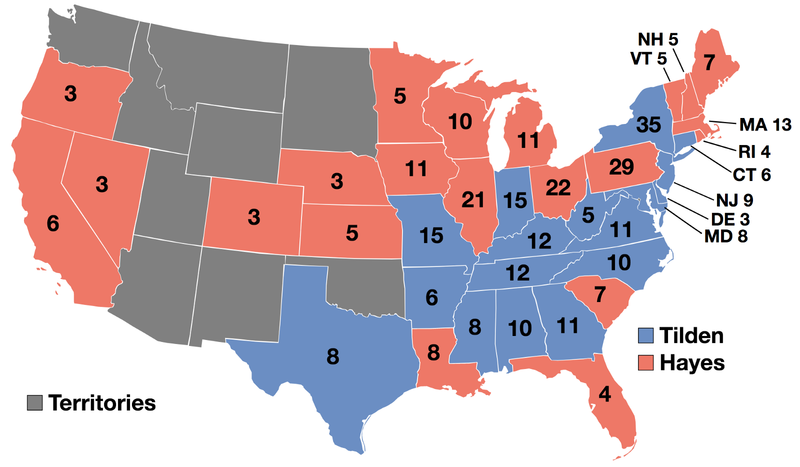 Despite Hayes’ defeat in the irrelevant popular vote and apparent defeat in the malapportioned Electoral College, the Republicans agreed to abandon Reconstruction, and thus true liberty for former slaves, in return for the disputed electoral votes that gave the presidency to Hayes. If the popular vote had chosen the presidency in 1876, there’s no telling who would have won, because the parties would have campaigned for every vote everywhere. The Republicans would have had great incentive to turn out the manumitted, enfranchised slaves as voters in the south. Instead, with the winner-take-all rule making it very likely that white people in the old Confederacy would compose a plurality of voters that won all electoral votes, the Republicans had little incentive to fight for African Americans’ votes. Because of the Electoral College system, the Republican Party could — and did — give up on Reconstruction and break faith with African Americans recently freed from slavery without losing anything in future presidential elections. A one person, one vote, national system would have given Republicans a continuing interest in the votes of African Americans in every presidential election. But under the Electoral College system, African Americans’ votes were politically expendable. The results were tragic. The full poisonous flowering of this system was the lack of concern about the Jim Crow regime that oppressed African Americans in the south for nearly a century past the supposed end of the Civil War. The slight preponderance of white votes in southern states, and utter irrelevance of runner-up votes in the Electoral College system, meant that the Republicans lost nothing in the presidential sweepstakes because Jim Crow repressed African Americans’ votes. At the same time, the Republicans benefitted from increased electors in the northern states as a result of incoming immigration, even when most immigrants enrolled in the Democratic Party. With the extra electors in the north boosting their presidential prospects, and little hope of winning electors in the south, the Republicans lacked the incentive to fight for the right to vote by former slaves and their descendants. Between 1860 and Franklin Roosevelt’s 1932 election, the Democrats put only two people in the presidency. The electoral system imprisoned the party by giving it a base in the segregationist south. The election of 1880 illustrated the trap. The Democratic candidate fell only a thousand votes short of winning the pointless national popular vote. If the national vote mattered, it’s easy to imagine the Democrats adding other factions to their coalition so as to prevail in a national vote, and presumably pushing a progressive agenda much earlier than Wilson did. But the Electoral College confined the Democrats to the south, leaving the party with a base almost entirely in the hold of segregationists. This base finally broke the Republican lock on the presidency for Grover Cleveland in 1884. However, its shakiness was demonstrated in 1888. Cleveland won the meaningless national popular vote but lost New York’s electors when Tammany Hall failed to deliver him a plurality in his home state. Nearly three decades later, in 1912 this coalition put Woodrow Wilson in the Oval Office in an ersatz electoral landslide resulting from Theodore Roosevelt’s split with incumbent William Howard Taft, the two Republicans drawing nearly 60% of the popular vote as opposed to Wilson’s 41%. Reflecting the wishes of his base, Wilson paradoxically combined a progressive agenda with virulent racism during his two terms. Meanwhile, the Republican Party’s general indifference to the votes of African Americans, stemming from their irrelevance to the presidential election, left that block available to Franklin Roosevelt’s redefinition of the Democratic Party in 1932. His new coalition of immigrants, highly educated people, working class white people, and African Americans voting where they could (as in New York, Illinois and Michigan) produced political power for the Democrats that lasted until the Vietnam War fractured the coalition in 1968. In those nearly four decades, the white South still managed to slow the federal government’s efforts to give the descendants of slaves true civil rights. But again, that capability to postpone the realization of fairness stemmed from the Electoral College system, where African American votes for president in the south could choose no electors and were irrelevant to the presidential selection even if they had been given full access to the ballot box. Since 1968, white southerners have allied with middle-income white people in the Midwest to compose a block of voters that have disproportionate and determinative impact on the Republican Party’s policies, preferred presidential nominees, and positioning on all major issues. In this century, that block can win the Electoral College but does not represent the views or votes of most Americans. If the national popular vote chose the president, long ago the Republicans would have sought a different coalition — because only a different mixture of factions could produce on a reliable basis a plurality of all voters in the country. The Democrats too would have been obliged under a national voting system to have composed a coalition that paid more attention to the declining economic condition of working-class voters across the country. Further, Democrats could no longer take African Americans’ votes in blue states like California and New York for granted. The two parties each would have had to appeal to more people in more regions and would have been pushed closer to compromise and efficacious results. The presidential selection system has exacerbated and perpetuated race-based division in the United States since the ratification of the Constitution. Unless and until the legislatures and people of the different states decide to choose as electors those nominated by the party whose candidate won the national popular vote, it will be the problem of the 21st century as well. Reed Hundt is a former Chairman of the Federal Communications Commission (1993–97) and is currently Chairman and CEO of Making Every Vote Count. Follow us on Facebook and Twitter. A nonpartisan nonprofit dedicated to changing how America selects its President.